The RSLogix Micro Starter Lite software is only available as a download at http://www.ab.com/programmablecontrol/plc/micrologix/downloads.html.Â If you are starting from scratch and do not have the RSLinx software then download the kit bundled with RSLinx Classic Lite.Â FYI, I find it a bit confusing but they also sell software called RSLogix Micro Starter which supports the full MicroLogix range. If you do not have a MicroLogix 1000 or 1100 to play with then download the RSLogix Emulate 500 software.Â Youâ€™ll be able to use this to simulate a real PLC. Once youâ€™ve downloaded the software and extracted it then install RSLogix Micro followed by the RSLinx Classic Lite software.Â Next, install the RSLogix Emulate 500 software. RSLinx is the software RSLogix will use to communicate with your PLC or in our case to the emulator. Leave the configuration options as Station Number 00 and click OK. Your driver should now be running and look like the picture below. Ok, thatâ€™s ready to go.Â Close the Configure Drivers dialog box and close RSLinx.Â Actually RSLinx is now running in the background and youâ€™ll probably see its little icon in the system tray. In my case Iâ€™ve chosen the simplest MicroLogix 1000 and then clicked the OK button.Â FYI, if you ever work with the purchased version of RSLogix 500 then there will be a lot more items in this hardware list.Â A blank project now opens up. Letâ€™s make a simple rung to test in our emulator.Â Make sure the cursor is on the rung with the END on it and then click the New Rung icon in the instruction toolbar. Now click on the â€œExamine if Closedâ€ Â instruction to add it to the rung.Â Double click on the question mark above it and enter I:0/0 as its input address.Â Just leave the description pop up box empty by clicking OK.
Next, click on the Output Energize Â instruction to add it to the right side of the rung.Â Double click on the question mark above it and enter O:0/0 as its output address. Â Just leave the description pop up box empty by clicking OK.
You should now have something like below. 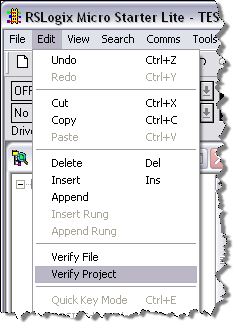 The next very important step is to verify the project with the Edit > Verify Project menu item.Â This will compile the project and get it ready for the emulator. Save the project as something like Test.RSS in an easy place to find like My Documents. 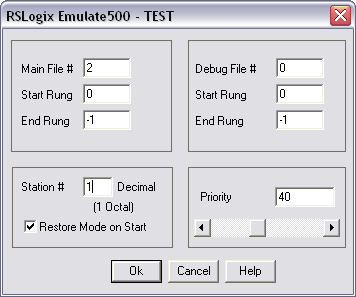 The emulator lets us test our work by running a virtual PLC.Â Weâ€™ll be able to download our program to it and run it in a very similar fashion to a real PLC.Â Start the emulator with the START > All Programs > Rockwell Software > RSLogix Emulate 500 > RSLogix Emulate 500 shortcut.Â Â The emulator is pictured below.Â I know.Â It doesnâ€™t look like much but it gets the job done. Select File > Open and open the RSLogix project you created earlier (I named mine TEST.RSS).Â In the dialog box that pops up put the Station # as 1 and click Ok. 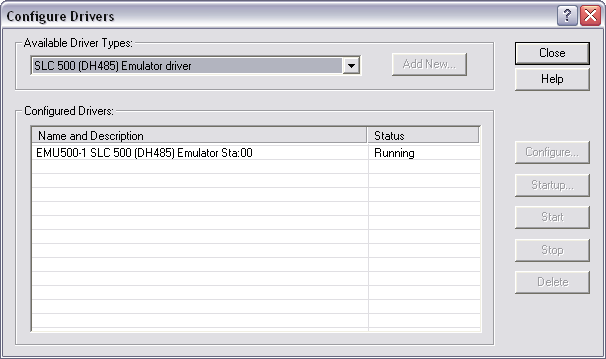 Believe it or not but the emulator is now ready.Â Leave it running and go back to your project in RSLogix Micro. In RSLogix Micro Starter select the Comms > System Comms menu item.Â The following dialog box will pop up. 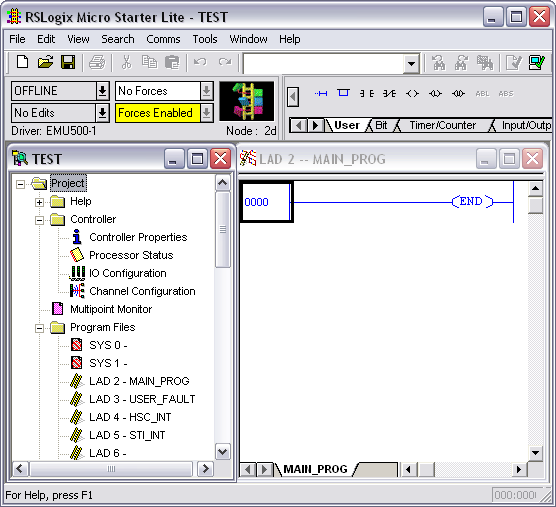 In the left hand pane, drill down and select the â€œ01, MicroLogix 1000, TESTâ€ processor.Â Yours might look a little different if you selected different hardware or gave the processor a different name.Â For good measure make sure Apply to Project is checked and then click on Download.Â When prompted to go Online click on Yes. If successful youâ€™ll see the ladder picture spinning round on the online toolbar.Â To scan the ladder logic put the processor into Run mode by clicking on the arrow to the right of mode status (REMOTE PROGRAM). 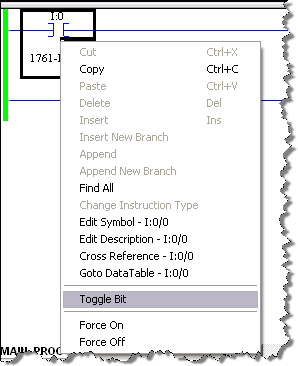 To test the ladder logic, change the input state by right clicking on the address and selecting toggle bit. You will see the instruction go green indicating it is true and it will make the output instruction turn green also indicating the output is turned on. Thatâ€™s it!Â You get all that for the cost of a download.Â Now break out the manuals and start learning about all the different instructions. Submitted by Zaenal Asiqi (not verified) on Wed, 2010-03-31 05:22.
thank you for this information couse i look it for long time to get information about rslogix emulator 500.i got this information from my forum in www.linkedin.com. Submitted by stenin (not verified) on Thu, 2011-12-29 02:17. Thanks this is very cool, portable generator review i'm a student and this will be very helpful. Submitted by Zackery (not verified) on Fri, 2012-04-13 02:29. That was my first question too. For any development there sould be options and method for a good example, efficient control and writing assistance for problem resolving. Programming is very similar. Submitted by Zaenal Asiqi (not verified) on Fri, 2010-04-16 18:14. It is really that i can't edit the program when it is running? Submitted by Tim Young on Sat, 2010-04-17 10:14. Correct. The MicroLogix does not support run time edits. Submitted by vamshi (not verified) on Thu, 2011-06-09 02:53. We cant edit the program during running of program, we hav to make it offline and edit and then again download and got to run mode....!!!!!!!!!!!!!!!!!!!!!!!!!!!!!!!!!!! Submitted by Rohan43212 (not verified) on Tue, 2012-09-25 22:19.
yes thats true because we have to download the program into the plc first and then go online and then to run mode so being in run mode its impossible to change the ladder but yes we can change the input values in some cases. Submitted by Anonymous (not verified) on Wed, 2010-06-16 02:14. In RSlinx i cont find this "SLC 500 (DH485) Emulator driver"..Please help me with this how to find it..I am a beginne,seeking your help..thank you.. Submitted by Tim Young on Fri, 2010-06-18 22:33. Did you just install from the download link? Which version of RSLinx is it? Submitted by SRA (not verified) on Thu, 2010-08-19 08:19. I have the same problem as ther person above. When I try to configure the emulator driver, I am not seeing any showing up as an option. PS: I installed RSLinx from an RS Logix Micro cd that I purchased. But when I open it, it is showing up as the "Lite" version. The Rs Linx version I have is 2.54.00.11CPR9SR1 and I am running Windows Vista. Can you help me? Submitted by Anonymous (not verified) on Wed, 2010-11-17 03:52. Submitted by Dariar on Fri, 2010-08-20 18:29. I don't have the SLC 500 driver in my list. I have success on my XP Pro PC. Submitted by Tim Young on Fri, 2010-09-03 07:21. Submitted by Felix (not verified) on Wed, 2010-09-15 11:58. Submitted by jcpt (not verified) on Sat, 2010-09-18 14:53. I download this file http://files.rockwellautomation.com/Public/RSLogixMicroLite_Linx.zip, i install and i not problem. I have problem when want GO ONLINE, i see communication path has not been configured and Driver unknown. Submitted by Anonymous (not verified) on Fri, 2010-11-05 09:46.
ommunication path has not been configured and Driver unknown. Submitted by Anonymous (not verified) on Mon, 2011-02-07 11:04.
go to controller properties.Then communication.then go to driver.choose EMUl.It is will now going to work.Make sure that you have launched emulator correctly through Rs link. Submitted by hussey (not verified) on Sun, 2010-10-03 12:08.
i had forgotten everything... about .. how to run rslogix..rslinx..emulator..
this helped me getback to the basics.. Submitted by rich (not verified) on Tue, 2010-11-02 14:19. I have the purchased version but, not let me install the version micro because it's say me i have "the RSlogix 500 English is installed. It must be uninstalled before RSLogix Micro english 8.10" I use it, for the working, but i want make testings in my house. that come from?,. HOw do i utilize both?., Thanks! Submitted by nasir rasool (not verified) on Sun, 2010-11-28 19:21.
well i did all the same as u instructed but in last on emulator when i open the file , it showing message , slc500 program. Submitted by Anonymous (not verified) on Mon, 2010-11-29 18:28.
thanks this is very cool, i'm a student and this will be very helpful. Submitted by imam (not verified) on Sat, 2010-12-11 04:47.
rs emulate 500 program must compile, i have compile program and no erros founds, ? Submitted by Anonymous (not verified) on Fri, 2011-03-04 20:51. Thanks for all your effort for teaching PLC. i am having a problem as "server error" when ever i turn on my rs logix program. i tried to uninstall it and reinstall it again but still no result. Submitted by The Regulator on Wed, 2011-03-30 04:11. I've downloaded RSLinx Classic, RSLogix Emulate 500 and RSLogix Micro Starer Lite. Can I create a ladder logic that implements PID in it and be able to test this using Emulate 500? Submitted by Tim Young on Sat, 2011-04-02 00:55. Submitted by Coowallsky (not verified) on Fri, 2011-12-16 11:06. Yes. You'll have to create logic to model a process but that is not difficult. Submitted by arellano81366 (not verified) on Wed, 2011-05-18 15:49. This post has been really useful! 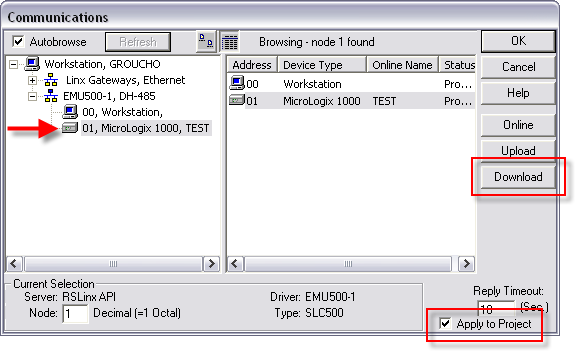 In just minutes you told us how to use RSLogix Micro Lite and RSLogix Emulate 500. And as you mentioned, all the software that we are using is legal and free. Submitted by Jayesh (not verified) on Mon, 2011-05-23 05:17. I have downloaded RSlogix micro starter, RS linx lite version 1.7 and RSlogix emulate 500(can not find RS linx lite version 2.5, could see RSlogix micro starter with RS linx bundled, however not in English language, it is in chinease and not of my use). I can not emulate the programs I wrote in RSlogix starter lite. Please advise / help. Submitted by Anonymous (not verified) on Mon, 2011-06-13 06:40. Submitted by Anonymous (not verified) on Sat, 2011-08-13 08:56. ....Once you have the emulator up and running... It is easier and clearer to see what is happening when you set up and use the multi-point monitor to toggle the bits instead of directly on the ladder. Submitted by zek (not verified) on Tue, 2011-08-16 12:04.
wrong due to indication command shown " failed to show RSwho,need register file: C:\prgrm file\rockwell software/Rscommon\RSOBSERV.exe "...what is the root cause of this problem?what should i do? Pls advise.TQ....hope to hhear from you ASAP. Submitted by Mikey (not verified) on Wed, 2011-08-31 23:27. To whomever posted this instructional guide: thank you, grazie, Dank u, Kiitos, Danke, Efharisto poli, Toda raba, Nagyon kÃ¶szÃ¶nÃ¶m, Go raibh maith agat, Arigato, Komapsumnida, Moran taing, and as the Zulu say it..Ngiyabonga ka khulu! Submitted by Mikey (not verified) on Wed, 2011-08-31 23:39. 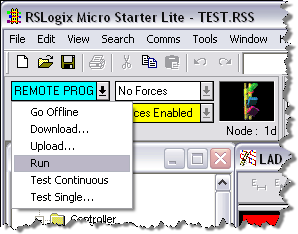 As if you haven't helped out enough already, I have one question now that I am programming.. Do you know of any other programs out there that may interface to RSLogix Micro Starter Lite that would act as a "real world" output scenario for my programs? I haven't yet bought a processor to attach any real I/O, but a gui with a conveyor, a fluid drum, thermal sensor..heck a stoplight would be good enough for me! I would just like to see some cool results (as if a rung turning green in online mode isn't cool enough in itself). I'm not sure that this is even possible, but I figure I will throw this out there for the masses to ponder and help me out with. Thanks in advance! Submitted by Anonymous (not verified) on Sun, 2011-10-02 05:03. Mikey, there is a bit of software called Automation Studio that might just do that. I haven't been able to run it yet but, from what I've heard, it should do the trick! Good Luck!! Submitted by Anonymous (not verified) on Fri, 2011-09-30 11:04. Thank you very much for your information, it was very helpful. I have just run the programme you showed and it works a treat, so I am looking forward to playing around a bit more with the software to get my head around it. Thanks a bunch, really great work! Submitted by Dipak (not verified) on Sat, 2011-10-08 06:58. I am download RS linx lite 2.50 & installed. 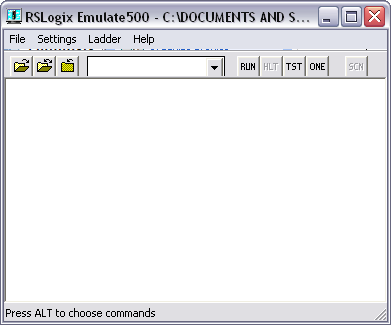 then installed RS logix 500 emulator. but when i opened RS linx for go to driver configuration,only found RS linx lite classic is not working. please help me how to run the application?? if possible please provide me brief procedure for setting. Submitted by Anonymous (not verified) on Thu, 2011-11-03 16:11. Submitted by Uday (not verified) on Thu, 2011-11-17 00:39. I have tried to download the program in Rockwell software but the Rslogix microstarter is in chinese version only. I dont have the Rs linx. can u please help. Submitted by toroke on Wed, 2011-12-07 17:19. I have downloaded rs logic emulate 500,however it says I need to update the registry files when I launch it. How do you do that? I have already uninstalled it and reinstalled it twice, and I come up with the same problem. Submitted by Banjamin (not verified) on Fri, 2012-02-24 01:13. Submitted by fred b (not verified) on Fri, 2012-03-09 14:50. Submitted by Pierre (not verified) on Wed, 2012-03-21 19:11. Installed in a breeze. Clear and precise installation guide. Is working fine. Thanks a million. Win7 Home. Submitted by DRW (not verified) on Sat, 2012-05-12 09:07. Submitted by daehl (not verified) on Thu, 2012-05-17 22:13. Just finished a class on PLC programming using RSLogix500, and wanted to try it at home. Found these instructions and an hour later or so, I'm up and running. Thanks for the extremely easy instructions and screenshots. My experience was exactly as you pictured and it's working flawlessly (even though I'm running this on my MacBook Pro using VMWare 4 and Windows XP). I was a bit worried there would be some hitch, but it's working great so far. Thanks again! Submitted by Anonymous (not verified) on Mon, 2012-10-01 12:18.